10 – Infinite Shine Mini Nail Lacquers 3.75 mL – 0.125 Fl. Oz. 1 – Infinite Shine Mini ProStay Primer 3.75 mL - .125 Fl. Oz. 1 – Infinite Shine Mini ProStay Gloss 3.75 mL - .125 Fl. Oz. Infinite Shine Mini 12- Pack is rated 3.0 out of 5 by 4. Rated 3 out of 5 by JammyJay from Looked great but didn't last long! 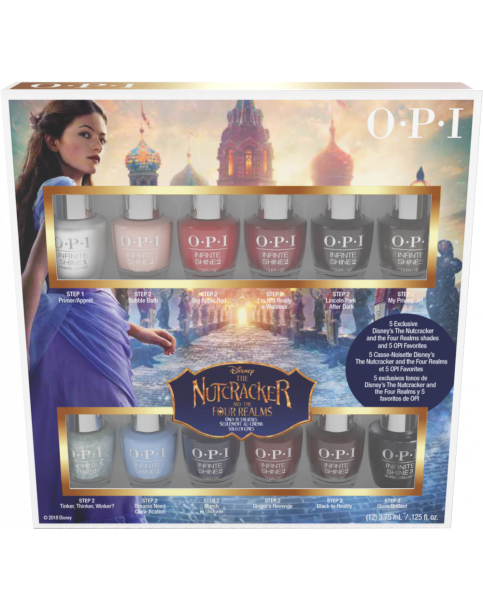 I bought the mini pack about a month ago and was literally so excited to finally have some quality OPI products to add to my gel collection. I applied the base, polish and top coat all from the set and my nails looked great. I prepped beforehand as normal but for some reason, my nails all split or broke less than a week later. These products weren't 'strong' enough for my nails and I have to admit that I am disappointed with the very short lasting results and also the weakness of my nails when wearing the products. Such a shame as it's a lovely set but unfortunately doesn't suit my needs. Rated 1 out of 5 by Jo R from Awful product! The infinite shine range does not do what it says on the tin! Mine chipped on the first day. No extended wear or gel-like durability. This product is rubbish! Rated 5 out of 5 by Rosie45 from Great present I have bought this as a present for my granddaughter and I am sure she is going to be very pleased with it as I am.